I’ve been busy putting the finishing touches on all the 2018 calendars. This year I’ve got a couple little surprises in store, but I’ll share more on those in a little bit. First things first, we need to take a peek at the 2018 dated monthly calendars. Today I’ve got the single page layouts in both half and full size for you. I really can’t wait to see what you think, so let’s jump on down shall we? Sunshine Skies (2017) – collection page is coming. and now Peachy Green for 2018. Ready to see the monthly designs? 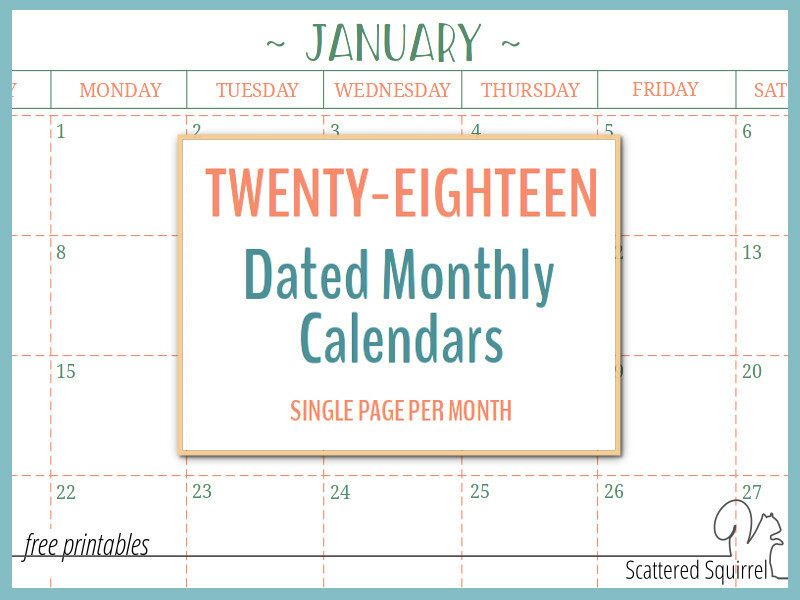 Both of the calendars I’m sharing today feature a single page per month. Each PDF file has all 12 months of the year in it to make printing them easier. First up, let’s take a look a the full-size version. I kept it really simple and clean, relying on the fonts and the dashed lines to help add a little something special to them. I made a change to the half-size version. You might have noticed in the picture that January is sitting above July. I did this on purpose so that they can be printed double sided. Figuring out the layout wasn’t nearly as tricky as I first thought it would be. There are no special printing instructions to follow. 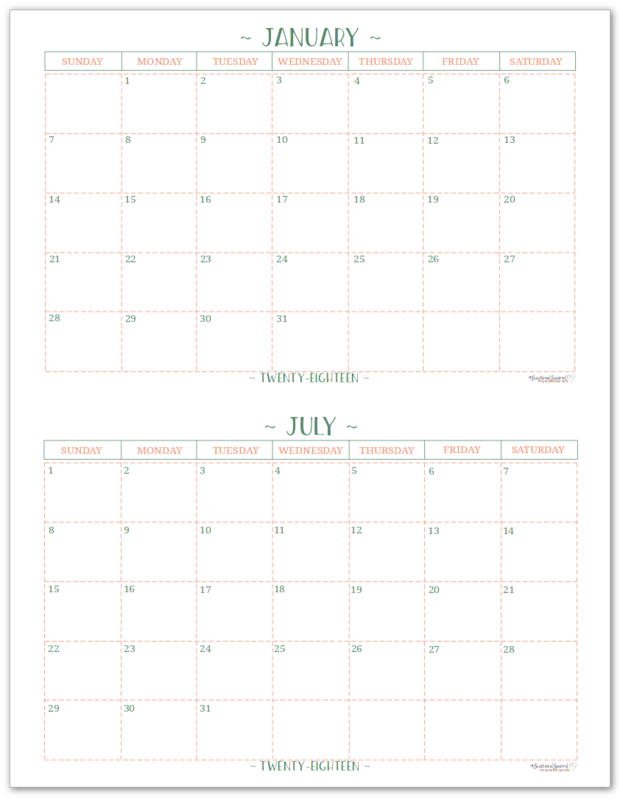 Just print double-sided as normal and cut the page in half before hole punching to fit your planner. I don’t normally plan a full year in advance, but I know that many of you need too. Whether you’re a teacher, a small business owner, blogger, have things coming up that you need to plan for, or just like having next year’s calendar ready if you need it – I’m thrilled to be able to offer you this option early. This year I wanted to change this up a bit. I’m working on adding two new sizes to the dated calendars this year – personal and pocket size. Both are proving to be a little more tricky than I anticipated, especially since I want them both to be easy to print double-side. Look for those to be coming out later in June. Every year I get asked if I will be making a dated version in a previous year’s design. Nope! Creating the calendars is really time consuming. It’s just not feasible for me to do all of them. However, for those who really want them – I will be taking orders for dated versions. These will not be free options. If you’re interested, send me an email (Contact Me Page) for more information. I’d love to hear what you think of the new design. Do you start planning for next year early? I’d love to hear more about how you’re using these printables. Drop me a line in the comments below and let me know! I absolutely love all of your stuff. I did notice that the 2018 half-size has January starting on Sunday, when it actually starts on Monday. I am sure that this was just something that slipped right past you. I love the work and effort that you put into each of your printables. I am a teacher, who uses an A5 size planner, and your printables are the only ones that I can find that fit my needs. I would love to see you develop some teacher stuff (lesson plan pages, attendance/grade sheets). Thank you!!! Oh my goodness Casey thank you so much for pointing that out. I’ll get that fixed right away. I’ll double check the rest of the months to make sure they’re all correct. Do you need me to email you the updated copy? It’s been updated and replaced. Thanks again for letting me know. I can’t believe I overlooked that. lol I’m happy to hear that you are finding some printables that work for you and fit your needs. It warms my heart to know that they’re being used. Thanks!! If I hadn’t been working on next year’s curriculum, I would have noticed either. Again, thank you for all that you do! Love your stuff!!!! When will we get the two age month spreads? I’m already planning through July of 2018. Hi Julie! I’m hoping to have the two page spreads ready to go tomorrow or Saturday. We’ve had an unforseen hectic week here so I’m running a bit behind on things, but for sure they will be up before the end of day on Saturday at the latest. Thanks for the great calendars! I like the colors, they kind of remind me of watermelons. I keep them on the fridge to keep our family schedule organized. Hi! Is there a 1/2 size vertical version of the 2018 monthly calendar? Hi Holly, I haven’t done any vertical dated calendars. Not many people want them. I’ll add it to my list though. If I have time before the new year I’ll try to get one done up. I would love the vertical version as well! I love these and would like the horizontal version. Any chance of having those? Hi Denise, all you need to do to download them is to click the picture of the one you want. Any chance of having the vertical version of the dated monthly calendars? You do great work, thanks so much! Hi Denise, I don’t normally make vertical dated calendars, aside from the 2 page ones. I’ll definitely add them to my list and if I have enough time before the new year I’ll try to make them up. these are gorgeous – thank you! Thank you so much for your lovely calendars. I use them at work for the schedule requests for my staff. I always have enough space to type in the requests and the colorful styles make the task less of a burden! I’m so happy to hear that you’re finding the calendars helpful for you. Found you last year when looking for a simple, free, printable monthly calendar to track insulin pump site changes (the sites must be changed every three days, and with two kids on insulin pumps it’s easy to lose track!). LOVED your half-page version; I didn’t cut them apart, but hung them on the fridge as-is and switched to the next page every two months. With the new layout, I’ll have to cut them apart and use a month at a time this year (I prefer not to print on both sides since I’m a little OCD about each month being clean with no bleed-through from the other side), but still so thankful for your free, simple-but-attractive calendar printables! This is so pretty!! Love it!! Thank you! Thank you for the printables, but I have to say that I don’t like the half-sizes for 2018. The format for 2017 was PERFECT for my needs. Mini booklets get lost in my large library of notes. I just really like to flip as LITTLE pages as possible, hence the half page. Making a mini booklet defeats the purpose for me. Cute design though. Ugh, the 2 month per page was my essential fridge calendar and am disappointed that it’s not in sequential order for 2018. I loved the previous year’s format where I could just fold it in half and then flip it over to reveal the next month. Now, after January, it will flip over to July….that’s not useful at all. I love your monthly calendars!! I use them to plan my shifts as well as my 3 kids and husband! I love the colors and how homey they feel – especially hanging on my wall. I am in need of a printable 2019 as my schedule comes out a year in adavance (April to April) Do you have a 2019 Calendar out yet? I can’t seem to find one on the site. Thanks! Hi Laurie, thank you so much for your kind words. I’m so happy that you like the calendars. I haven’t started working on the 2019 ones yet. They usually come out mid-April or early May. But I’ll make a note that earlier would be better, and see if I can get them done a little earlier this year. hello I was wondering if you a link for the 2 page per month spread for 2018. I love all your templates! especially the website password template! thanks! I do, you can find it at the very top of the Blog Page. (Just click the blog button on the top menu bar) All three posts for the 2018 calendars are just under my header. 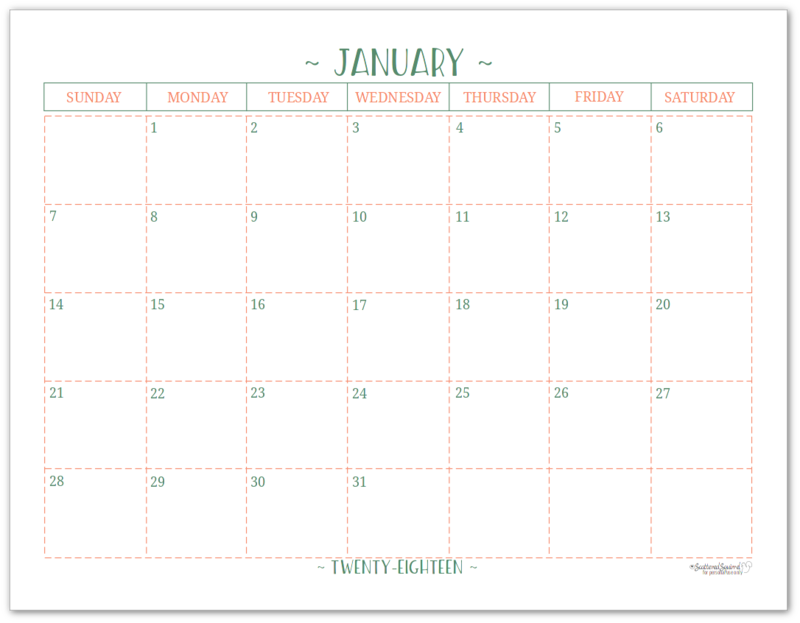 I was wondering if you could make a small change so that on one page it would be January and under February. So that the months will be in order. Last years it was in order but for 2018 it starts with January the skips to July. Thank you and I love your calendars it helps me with my school studies and keeping my assignments organize. Hi Mary, I will take a look and see what I can do. I did it this way to make printing doublesided easier, but I should be able to make the other version as well. I’m not sure when it will be finished, but I’ll move it up my priority list and see about getting it out before the end of the month. It would be nice if the half page option was sized for half size paper, 5.5 x 8.5 instead of full size and just cut in half. I’m struggling to find good calendar and planner pages that are actually half page/A5 so I don’t have to resort to just printing the full size on smaller paper, which leaves a lot of unusable space on the sides. Hi Erynn, I design the pages this way because most people don’t print on half-size pages. If you scale a full-size page to 70% it should print on a half page without too much wasted space. If you have Adobe Reader for printing, it will give you a preview of the scaled page so you can adjust it as needed. I’ll look into make the half-size pages indvidual pages in the future. It’s certainly an option I can try to make happen. I love your stuff. When I need to print out calendars, planning pages, etc. I know exactly where to go. Awww, thanks so much Suzanne! I’m so happy to hear that you’re finding the printables so useful for you. Thank you for the calendars… Do you make the one month – 2 page calendar starting on a Monday instead of Sunday? For some reason when I print out the half-size calendar sheets, the dotted lines don’t print. Any idea what may be causing this to happen? Hi Donna, I am so sorry to hear that. I’m not an expert with printers. My first thought was that perhaps one of the colours on your ink had run out, but you said just the dotted lined, not the days of the week too, so I don’t think that’s it. The only other think I can think of is that perhaps the file got a little wonky when it was downloaded. I know it happens sometimes. If you’ like, I can email a fresh copy to try. I just need to know which size and if it’s ok to use your email address to send it to you. I wondering if you have Sept 2018- Aug 2019 available? Not yet, but I’m working on an academic calendar for the 2018/2019 school year. Those will be coming out this coming week. I do have 2019 calendars that run Jan to Dec already up on the blog if you need something for next year more immediately.